The Greenhouse is designed to create the best environment for your plants to grow healthily, provide protection against rough weather conditions like rain, wind, and snow, and lets you exercise your green fingers in any place and any season. 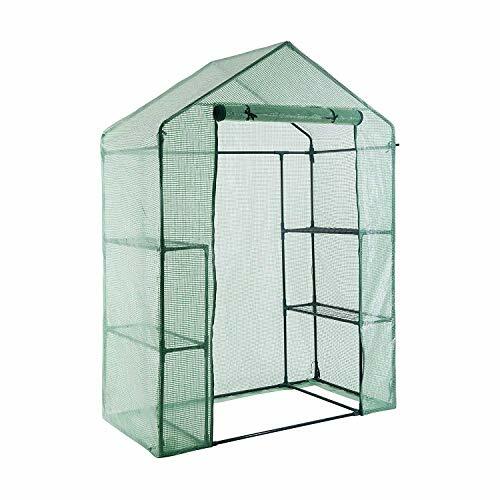 It is structured with durable rust-resistant tubes that will make this portable greenhouse last through the seasons. Designed with zippered roll-up door for easy access and screened ventilation for optimum air circulation. Ideal for starting seedlings, protecting young plants, and for extending the plant growing season. Environmentally friendly PE material, waterproof and sunscreen, good thermal insulation effect, non-toxic and tasteless, strong and durable. Size: 56.5" (L) x 29"(W) x 77"(H). Zippered cover--- Mid Walk-in Design offers enough growing space for large size plants and easy access & ventilation. Double tailors, high standard workmanship for providing long time using. Transparent PVC cover--- 100% Waterproof, UV protection, maximum Solar Performance, keep the greenhouse inside warmer and help to extend plant growing seasons. Also mini size greenhouse, easy to move outside or inside in winter. Easy and portable to set up or move. Ventilation design, internal ventilation, suitable varieties of flowers and plants for growth. If you have any questions about this product by YOUKE, contact us by completing and submitting the form below. If you are looking for a specif part number, please include it with your message.